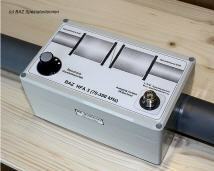 H2000Flex® is a top product for high frequencies (charge in the VHF, UHF and SHF band). The interior head, 2,62 mm in diameter, consists of soft copper. As dielectric serves a physical foam, which enables very good cushioning values. The large elasticity of this insulation material sets minimum bending radii of 50 mm. The outside diameter of the foam dielectric consists of 7,15 mm with an accuracy to gauge of ±0,15 mm. This dielectric indicates the following benefits: it is resistant to moisture, water-tight, mechanically strongly stressable, it permits stable cushioning to min. 3 GHz, and the cable is more flexible and “installation” opposite coaxial cables with solid dielectrics. Technical data: Tensile strength: 1300 N, characteristic impedance: 50 ± 2 ohms, resistor of the interior head: 3,15 ohms of km, resistor of the outer conductor: 11,05 Ohm/km, loop resistor: 14,2 Ohm/km, capacity: 80 pF/m, shielding measurement: (10 - 1000 MHz) =/> 100 dB, factor of the shortening: 0.83, return loss: 5-470 MHz >23,0 dB, 470-862 MHz >20 dB, 862 - 2150 MHz>18.0 dB.